Native iOS and Android mobile apps! Go mobile with OnePageCRM’s native iOS and Android mobile apps. You and your sales team can stay on top of your workflow and update your sales pipeline anytime, anywhere. The mobile app ensures you focus on taking action while you’re on the move. 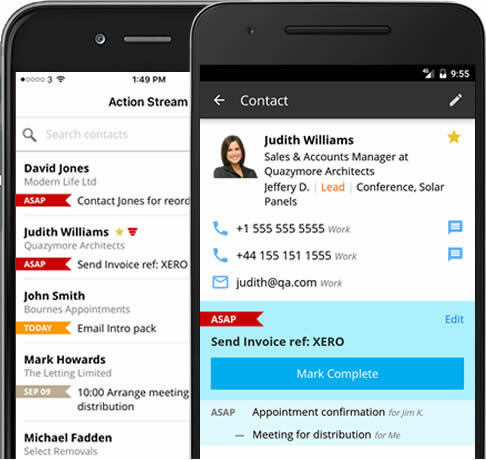 You can easily access your contacts and companies, track your call results and notes history and view and update your sales pipeline. This gives you the extra confidence and peace of mind knowing you have all the information to hand before a sales call or meeting. ✔ Update your pipeline on the go! Update your pipeline on the go! Having access to your sales pipeline on the go ensures you’re always up to date with your latest deals so you can work on closing as quickly as possible. The ability to see your forecasting data helps you determine if you're coming close to hitting your sales targets. Mobile Selling in real time! By having access to your data on your mobile, updated information is available to you and your team in “real time”, not creating extra data admin when you get back to the office. 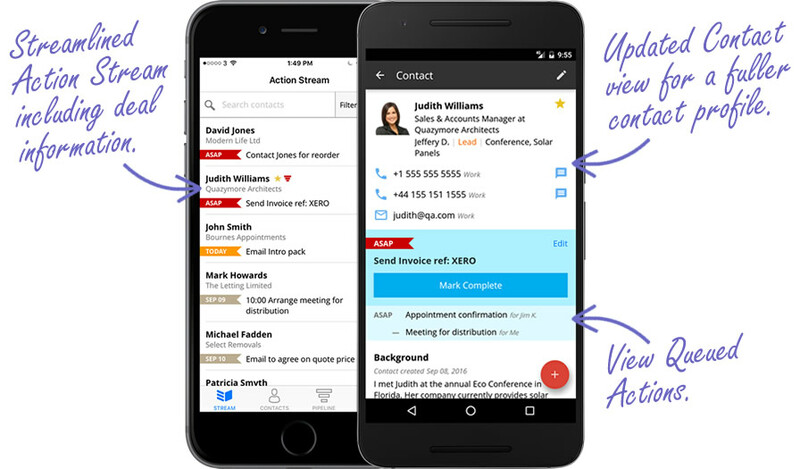 You can focus 100% on taking action with your contacts with a simple mobile interface. You can see what actions are scheduled for the future and prioritize your list accordingly. It only takes 1 click to complete an action! This ensures that you don’t miss out on following up with your prospects or customers. 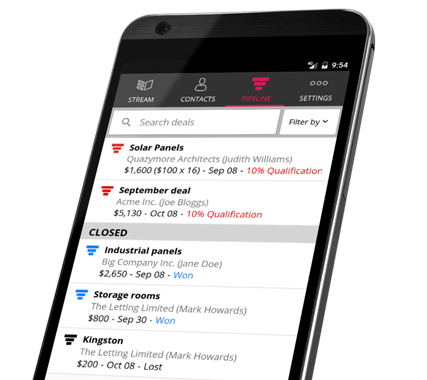 Update the sales call result and add a call note right from the palm of your hand. You can chose to voice record your call notes which saves you time typing. If you want to call a prospect, compose a text message or send an email, you just click on the phone number or email address right from within the mobile app - easy! 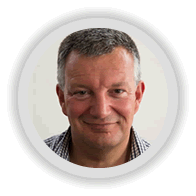 "Using OnePageCRM streamlines our sales process. We can more accurately quote and understand the project brief as it is being delivered for our client."